Abstract: Does my dog really love me? Consciousness, self-awareness, empathy, non-verbal communication, imitation, teaching, grief—. Carl Safina shows that in some surprising ways many non-human minds are rather similar to ours. They know who their friends are. They know who their enemies are. They seek status. Their lives may follow the arc of a career. Relationships define them, as relationships define us. 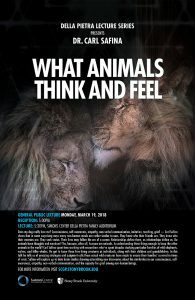 Do animals have thoughts and emotions? Yes, because, after all, humans are animals. Is understanding these things enough to keep the other animals in the world? Carl Safina spent time working with researchers who’ve spent decades studying particular families of wild elephants, wolves, and killer whales. He got to know these free-living creatures as individuals, along with their children and grandchildren. In this talk he tells us of amazing strategies and judgment calls these actual wild creatures have made to ensure their families’ survival in times of crisis. Safina will explore up-to-date brain studies showing astonishing new discoveries about the similarities in our consciousness, self-awareness, empathy, non-verbal communication, and the capacity for grief among non-human beings. 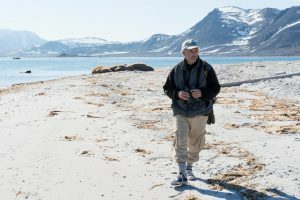 Conservationist and writer Carl Safina visiting a walrus colony on Amsterdamøya, Albert I Land, northwest coast of Svalbard. Dr. Safina was invited to sail with Greenpeace to bear witness to the changing climate in the Arctic and the impacts of industrial fishing on the marine environment.